Don't adjust your scope and sequence to fit Speak Agent's. It adjusts to fit yours! Say goodbye to one-size-fits-all solutions. With Speak Agent, custom content development is both affordable and effective. Other leading products cannot readily align to your scope, sequence, and pacing. This misalignment reduces efficacy and increases teacher burden. It is established learning science that the efficacy of computer-assisted instruction depends upon alignment with the classroom curriculum (Cassady, Smith, & Thomas, 2018). Academic language learning requires repeated exposure through oral and written resources in multiple contexts aligned to the curriculum (Peregoy & Boyle, 2013). And that alignment is exactly what you get with Speak Agent. 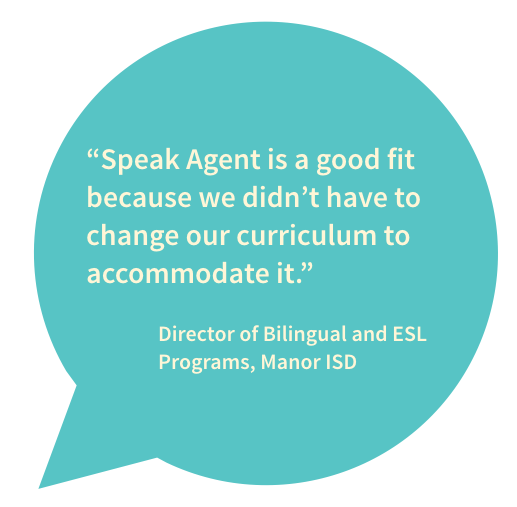 Speak Agent is a platform that not only tailors content to your curriculum, but also to your precise preferences. You control the exact concepts and vocabulary to target. You decide which texts to use and how to level them. Don't like a visual, a video, an audio file, or a definition? No problem. You can have your own custom versions. Need content tagged by standard or Lexile level? Done! You can even control who can create or edit content using Speak Agent's built-in authoring system. You share curriculum resources for each selected course/subject. These may include internal scope and sequence documents, workbooks, supplemental materials, spreadsheets, web resources—whatever useful information is at hand. You may include explicit vocabulary lists, or have the Speak Agent implementation team analyze your materials and recommend vocabulary sets. Likewise with supporting texts, videos, and other resources. Speak Agent drafts a content map for your review and revision. 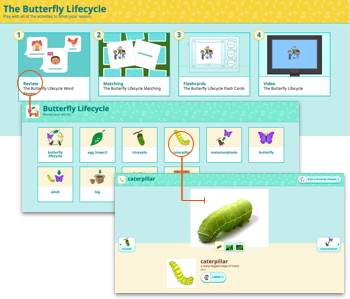 This sets out the number of digital lessons, their titles and topics, the supporting resources to be used, and the games and activities to develop. Speak Agent inputs or creates the content "building blocks" such as vocabulary sets, texts, and supporting media resources. The platform includes a proprietary lexical database with tens of thousands of words and multimedia assets (shown at right) that speeds up the process immensely. Speak Agent builds games and activities from templates using the lexical database and content building blocks. For example, a brief story is converted into an interactive cloze activity or a series of sentences is converted into a voice recording activity or puzzle game. This is done using the platform's authoring tools at an order of magnitude lower cost than building from scratch. The figure below shows an example of a text passage (below left) used to generate a puzzle game (below right). Speak Agent assembles these activities and other components into the lessons outlined in the content map. Each lesson can be tagged with keywords, grade levels, Lexile levels, subjects, and more. For example, digital lessons can be searchable by standards and resources such as CCSS, NGSS, TEKS/STAAR, Engage NY, CPALMS, WIDA, and CA ELD. Speak Agent develops a custom lesson plan for each digital lesson. This provides strategies to accompany each activity, estimated time to completion, and any preparation, prompts, or answer keys needed. Your team can review and approve content development at any step along the way. Once we have the curriculum map approved, your first digital lesson can be ready for students to starting using within days. Nothing is worse than content that is past its expiration date. With the Speak Agent platform, you (or your dedicated Speak Agent team) can modify digital curricular content and release a new version the same day so that students are always learning current content. You can add new texts and media resources around contemporary events (like a hurricane), new scientific findings (like Pluto's demotion to a dwarf planet), or new pedagogy (like a new math technique).